Trouble is a board game in which players compete to be the first to send four pieces all the way around a board. Pieces are moved according to the roll of a die. 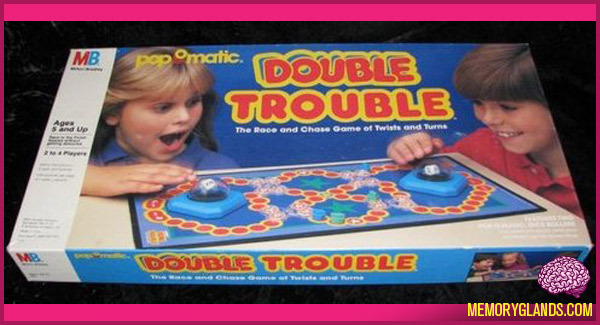 Trouble was developed by the Kohner Brothers and initially manufactured by Irwin Toy Ltd., later by Milton Bradley (now part of Hasbro). The game was launched in the United States in 1965. Players can send opponents’ pieces back to the start by landing on them. Pieces are protected from capture after arriving in the final few slots. Unlike more complex race games, however, counters cannot be maneuvered to block opponents’ moves. The most notable feature of Trouble is the “Pop-O-Matic” die container. This device is a clear plastic hemisphere containing the die, placed over a flexible sheet. Players roll the die by pressing down quickly on the bubble, which flexes the sheet and causes the die to tumble upon its rebound. The Pop-O-Matic container produces a popping sound when it is used, and prevents the die from being lost (and players from cheating by improper rolling). It allows for quick die rolls, and players’ turns can be performed in rapid succession. The die is imprinted with Arabic numerals rather than the traditional circular pips (though the circular pips are used in the Travel version, which contains a cover to keep the pegs from being lost). Players may only move pieces out of their start when the die lands on “6.” Getting a “6” at any point in the game also allows the player to take another turn, even if the player cannot move any of their pieces (as they cannot land on any of their own pieces). They can also move a new piece out even if they have another piece currently in play and can also do the same if another player’s piece is occupying their “start” space (thus sending that player’s piece back), but cannot do so when one of their own pieces is occupying their “start” space. If the die in the “Pop-O-Matic” container has not clearly landed on a number, then the player who popped it can tap the “Pop-O-Matic”, but may not re-pop while the die is in limbo. The player can flick the board, but should not flick so hard that the board is moved. Chance plays a part in the way this game is won. Large numbers allow the player’s piece to move further around the board, but small numbers can save the player from opponents. Players may not jump over their own piece when at home.